Our tester often fairs badly, but gives a better indication of download performance, as we average over the total time of the download. The tbbmeter tool is a good way of seeing how fast what you actually download is running at, rather than running a speedtest all the time. It also has a couple of tests built into it. I've used ttbmeter in the past, trouble is 4 networked PC's. Fair point. As I can't get my sync speeds or line stats out of my router/modem, I'm interested in peak just to see what it should be capable of. Also, it's not so cool to compare sustainable/average download performance rather than peak performance/capability - I know I'm setting up the reply "it's not the size that matters; it's what you can do with it", but I'll leave that there! 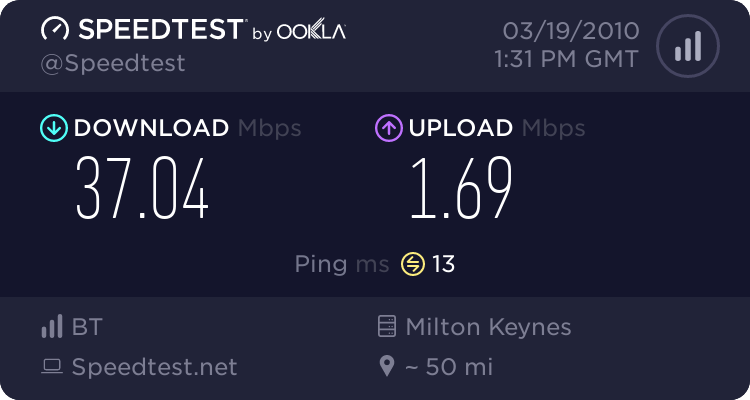 Fwiw - I can't get much more than 20Mb out thinkbroadband's tester - yet when I try some of the others, such as Ookla, I don't see the dial dropping below 35Mb throughout the test. I appreciate this is just a visual representation of many things going on under the covers though. It's a 'how long is a piece of string' question. There have been conversions where the engineer finds a fault on the pair, and so has to resolve this. As mentioned, fitting data extension kits take time, and also if the house isn't wired correctly this has to be sorted. The 'tests' taking a long time, as mentioned, will be because they are having a few 'issues' with the automated tests that they are being asked to complete. Good luck, it might be me ! Why would you think that it wasn't using PPPoE? It's just a VDSL2 modem, connecting into the same 21cn infrastructure. When I had mine installed I literally unplugged my ADSL modem and connected the VDSL2 one the engineer had brought and it came right up with the exact same settings. It does seem to be a dumb modem - if there's any smarts in there at all they're disabled.. the hardware has 2 ethernet ports and a battery backup port but no functionality on the second ethernet port at all. It doesn't respond to any of my probes.. I'll probably open it to see if there's anything like a serial port in there. There's space for another 2 ethernet ports, with the addition of a couple of components. The serial port connection is clearly marked. Contrary to the spec on the huewei website there is no wifi nor is there anywhere it could be added. If its PPPoE where are you supplying the credentials for the PPPoE session. http://www.openreach.co.uk/orpg/products/nga/fttc/do... page 7, pppoe or DHPC, with the CP setting the PPPoE if they want. The modem is just a bridge. If you connect the modem to a PC that is exactly what you would do (and I assume most people are, except those on BT Retail using homehubs) - set it up for pppoe and supply a username/password. Mine's connected to a little ITX box I use for the purpose, running linux. The BT box is a customised box hence variation in specs? Yes does seem to be a custom job - the product code doesn't appear anywhere except once on the huewei website.